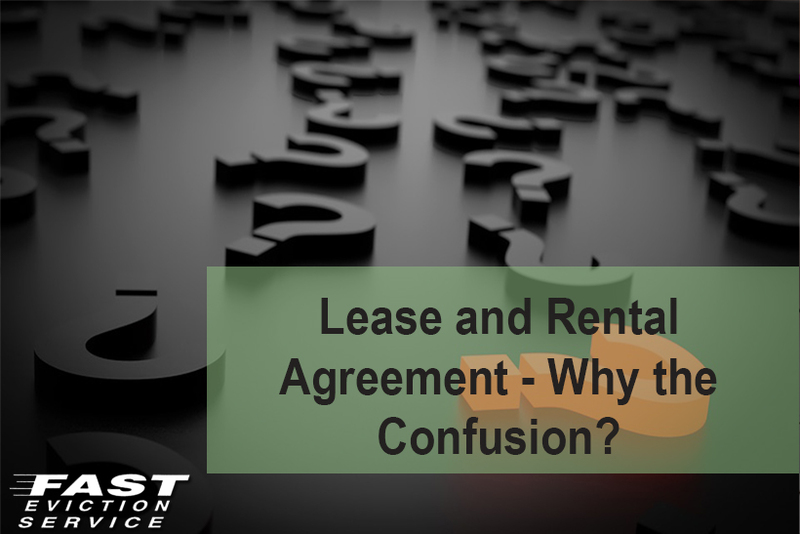 Lease and Rental Agreement – Why the Confusion? In the real estate business, Lease is a contract that lasts between 6 to 12 months and expires afterwards. Conversely, rental agreement is short-term contract signed between renter and property owner and it provides details about the periodic payments to be made on a month-to-month basis. Usually property owners lease their property and define the terms of rental agreement in lease contract to make the process more straightforward and authentic. If you are a landlord, you must have noticed that not all renters demand similar kind of arrangements. Some tenants rent because they are in-between the buying/selling procedure for their own home ownership for various reasons such as job relocation and are not interested in a longer term lease contract. This is why lease and rental agreements are considered two different options to fulfill the demands of different property owners and renters. But, many landlords find it difficult to fully grasp the concept of lease vs. rental agreements. Therefore, we are providing you a brief short comparative analysis of both and also some helpful information on which to opt for. Lease is basically a contract between the renter and landlord documenting that the property/land has been rented to another person for a specific period. Whereas, rental agreement is a periodic payment plan between property owner/landlord and renter for using and inhabiting the property. Rent is generally determined in a Lease agreement so both are correlated concepts. The length of a Lease agreement is often 6-12 months but it is upon the concerned parties to extend or minimize the length of lease. Rental agreement is short-term and the rent is paid on a monthly basis. Lease can be understood as a contractual arrangement between landlord and renter in which the latter promises to pay the former rent for using an asset. Renting is also called letting and hiring and it is also an agreement between landlord and renter but it deals with the payment method and amount only for temporarily using goods, services and/or property that is owned by someone else. In the real estate business, lease defines the terms and conditions of using someone’s property and includes vital aspects like the details of rented out property, length of renting and the stipulations as well as duties that both involved parties agree upon (such as if pets are allowed or not, etc.). Lease agreement can be made for any asset; it could be for building, residential space like apartment, house, room, commercial building like warehouse, office, shop and/or land. Lease and rent are correlated because rent is the series of payments that the property owner will receive from the tenants for using the asset. But, rental agreements are different from lease because it allows renters to occupy a property for a short period. Both the parties are liable to abide by the Lease contract for the entire duration and rent is required to be paid in a consistent and timely manner on a specific date of the month, which is usually the first day. Lease agreement also entails details about the consequences or penalties in case of late rent payment by the tenants. However, landlords cannot individually end the lease agreement or modify the terms/conditions without the rent payer’s agreement. In real estate, offering to enter a lease in written form, such as renting a residential space, is called binding and this is why landlords cannot create multiple leases to receive multiple rents. Every lease agreement has a starting and ending date, which allows the parties involved to either end or extend the terms for some more time, e.g. a year. This process is carried out around 60 to 90 days prior to the expiration of the lease period. This means, it is possible for renters to give notice to the landlord if they want to leave the property or need to extend it. Similarly, the landlord can inform the renters regarding any changes in the terms/conditions that the new lease agreement will involve such as rent increase. Renters have the right to agree to the new terms, negotiate or even reject them. Upon expiration of the lease, renters automatically switch to a monthly basis rental agreement until both the parties sign a new lease containing new expiry dates or both decide to end the monthly agreement and property is vacated. Tenants need to abide by the rules of the initial lease even on month-to-month payment basis. The reason why landlords choose to sign a lease agreement is that there are various disadvantages of month-to-month payment agreements not just for property owners but tenants as well. This sort of rental agreement provides tenants freedom to move at their own convenience without worrying about any binding agreement. This is not in the best interest of property owners as it makes rental income highly uncertain and this is why landlords usually charge higher rents for their assets if the agreement is on a month-to-month basis. This is done only to offset uncertainty but renters will never find this very attractive. In some cases month-to-month contracts are preferred in comparison to leases but this usually happens in highly transient populations such as Las Vegas. Short-term lease is a useful option as it won’t then involve higher rent charges. Rental agreements offer landlords a lot more flexibility since if there is an impending renovation of the property, they can easily commence it whenever the contractor agrees. Moreover, rental agreement provides flexibility to the entire renting process as landlords can change rent charges according to their own will. Since rental agreements are short-term therefore, those having short-term need to rent out their property can use this option. This is most attractive for students and those who have to rent a property for a few months like those who visit a city on work-assignments. However, if renting for a fixed period of time is on your mind, then leasing would be ideal as a property can be leased for 12 months or even more. It gives more stability to the renting process as both renter and landlord are bonded to fulfill the terms of the lease until it expires. If any of the parties fail to abide by the terms of lease, the other can seek legal help. Biggest advantage of lease for landlords is that the rent will be received for a specific time period and this makes them feel secure and comfortable with the arrangements. Furthermore, it allows maximum peace of mind to landlords since renters cannot vacate the unit without prior notice due to lease. Landlords and renters can both agree on oral rental agreements but despite being permissible it is better to avoid them for liability reasons. Written agreements are more useful, substantial and reliable than oral ones. Especially if the rental agreement is for occupying the property for over nine months’ period, pets are part of the family and property renting involves utilities and/or landscaping. Written agreements prevent all sorts of ambiguities, doubts and uncertainties and both parties are able to exercise their rights and duties without any confusion. Can You Terminate The Lease Early To Sell Property Or Move In?